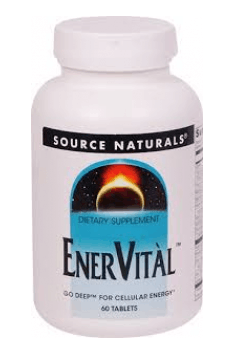 Source Naturals EnerVital™ is an advanced formulation that supports the production of energy in the organism. Its composition is based on natural and safe for health compounds, among which there are vitamins, minerals, valuable plant extracts and unique nutrients. This supplement is recommended for people who complain on a drop in form and suffer from energy deficits. It will be great in case of fatigue, exhaustion, both physical and mental. The compounds contained in it act on the cellular level, improve energy metabolism and increase the organism’s efficiency in ATP production. This converts into a quick increase in the level of vital forces and improvement of the psychophysical condition. A set of vitamins and minerals provides six key vitamins from group B and chromium. It is worth noting that they are not only in high, therapeutic doses, but also in forms with very high bioavailability. Vitamins B1, B2, B3, B5, B6 and B12 have a significant effect on metabolism. Their presence is necessary for the proper transformation of proteins, carbohydrates and fats. As a result, the food supplied to the organism can be converted into the energy essential for life. Group B vitamins have a powerful effect on the nervous system. Their availability conditions memory and mental performance. Deficiencies of these compounds lead to changes in the central nervous system, which often manifests as apathy, discouragement, lack of vitality, impaired concentration and insomnia. Beside group B vitamins, the aforementioned set also contains chromium in a patented, safe and bioavailable form ChromeMate®. It plays an important role in the carbohydrates metabolism and is a key stabilizer in energy management of the organism. It supports insulin activity and increases the cell’s sensitivity towards it, which contributes to the proper use of glucose and helps to normalize its level in the blood. Plant extracts are a natural source of many unique, not encountered elsewhere phytochemicals. They help to maintain the organism in an optimal condition and support the improvement of well-being. In the described supplement one can find, among others extracts from valuable plants classified into the group of adaptogens. They help the organism to adapt to changes and reduce the damage caused by the environmental factors. The Rhodiola rose extract contained in the composition is excellent in the context of reducing the mental and physical fatigue. It is an outstanding regulator of the HPA axis, and thus it allows to maintain the organism’s proper reactions in stressful situations and guarantees a quick return to homeostasis after the stressors are no longer active. Its effects are complemented by extracts from two types of ginseng (Asian and Siberian). They are known for their energizing properties. They increase energy levels, relieve fatigue and promote endurance strengthening. They also have a positive effect on mental health - they aid in focusing attention and strengthen cognitive functions. Chinese citric extract works in a similar way. It has strong nootropic and anti-depressant properties. By stimulating dopamine synthesis, it increases productivity and raises the level of motivation. Naturally, this supplement must have caffeine, the most famous stimulant substance in the world. It provides a powerful boost of energy, but also facilitates concentration and has a beneficial influence on psychophysical fitness. Its source is green tea leaf extract, which additionally provides strong antioxidants in the form of polyphenols. Complementary components increase the value of the supplement and elevate it above popular multivitamin complexes. This group includes several extremely unique nutrients that are strongly involved in energy metabolism at the cellular level. This set includes: coenzyme Q10, responsible for the proper course of cellular respiration and mitochondrial functions. Because of it the organism is able to generate energy in the form of a universal carrier, ATP. Alpha-lipoic acid, is another participant in energy production processes. It has a role of a cofactor for enzyme complexes involved in the production of ATP, and is responsible for glucose metabolism. An important component of ATP is D-ribose. It has also been added to the supplement, so that the ATP used during intense exercise can be quickly regenerated. The renewal of ATP stocks promotes the reduction of fatigue and increases the physical performance of the body. The energy processes happening in the mitochondria are also supported by the acetylated form of L-carnitine, the so-called ALCAR. This compound is involved in the metabolism of carbohydrates, and is also responsible for the transport of fatty acids inside the mitochondria. It also has a strong nootropic effect. NALT, a highly bioavailable, acetylated form of the L-tyrosine amino acid, also improves psychophysical fitness. It has the function of a precursor for the synthesis of important neurotransmitters, therefore it stimulates the functions of the central nervous system, strengthens well-being and increases mental efficiency. The optimization of nervous system functioning is also supported by taurine. It regulates the activity of the HPA axis and affects the GABA receptors. Additionally, it is involved in the glucose management and increases the transport of glucose into the cells. Its effects are felt both on the physical level (improvement of strength and endurance) and mental (strengthening mood and cognitive functions). Thanks to the addition of vinpocetine, cerebral circulation and supplementation of the brain tissue with the necessary nutrient are improved. Thus, both the ability to produce ATP in the brain as well as the performance of neurons increases. To sum up, Source Naturals EnerVital™ is a novel composition allowing for the improvement of energy production process in the organism and increase the level of vital forces. This supplement is ideal at times of huge physical or mental strain. Take 1 to 3 tablets daily with a meal, at the beginning of your day or when feeling fatigued. Do not take before bedtime. This supplement is based on natural ingredients, it is safe even with long-term supplementation. According to the manufacturer's recommendation, the lowest suggested dose is 1 tablet which is also a starting dose. Alternatively, the dose can be increased, but do not exceed 3 tablets a day. The supplement has a stimulating effect that is why it is most beneficial to take it in the morning, alternatively at the moment of performance drop. Avoid using before bedtime due to possible troubles with sleeping. Microcrystalline cellulose, hydroxypropyl cellulose, stearic acid, silica, dibasic calcium phosphate, modified cellulose gum, and magnesium stearate.